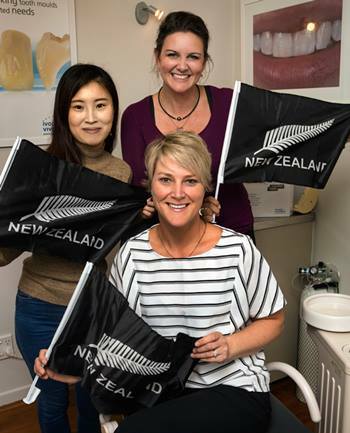 The team from PDP Denture Studio at Edgewater Drive were celebrating the America’s Cup win when the Times photographer walked into the studio, on the day the jubilant Team NZ did Kiwis proud. Founder and award-winning clinical dental technician Leah Taylor remembers how exactly four years ago when they had just moved into the premise at Edgewater Drive, a lot of patients would come in early to watch America’s Cup in the waiting room. There is a distinct sense of déjà vu as she recalls how the excitement of last week mirrored that of the crowd cheering on the yachtsmen so close to victory. But now, just as the City of Sails readies itself for the Auld Mug, the team at PDP Denture Studio is embarking on a new chapter. Supporting this change is Penny Hood, a new part-time receptionist who comes with a wealth of knowledge.“Penny was a dental assistant for many years at Fraser Smith Lowe Dentists in Pakuranga. She is also trained as an orthodontist dental assistant,” says Leah. With an eye for the best in the industry, Leah is one of two clinical dental technology practitioners in the country to have been selected for Otago University’s postgraduate and undergraduate accreditation panel. Meanwhile, it’s a busy time coming up for Leah as September marks her advancement from Vice President to President of the New Zealand Institute of Dental Technologists (NZIDT), a national body representing highly skilled professionals who specialise in the design, construction, repair and adjustment of a wide range of dental technologies. The influential educator will also be lecturing in Dunedin in September, Fiji in October and has been invited to speak at the Annual World Congress of Oral and Dental Medicine 2017 happening in Singapore in November. Despite her busy schedule, Leah works hard to maintain a relaxed and welcoming practice focused on creating high quality, aesthetically pleasing smiles. PDP has been highly sought after name for the past 20 years, leaving lasting impressions on patients from all over the world including Australia, the UK, US and the Pacific Islands. They specialise in comprehensive denture solutions from full to partial or implant retained dentures— as well as mouth guards and snore guards. Using the very best European materials and cutting-edge technology, PDP Denture Studio’s work is satisfaction guaranteed. Importantly, the team assists with long-term care of dentures. “We don’t just make and fit dentures. We also help existing denture wearers with services such as relines, repairs and cleaning,” says Leah. As people age or experience weight loss, the jaw shrinks and dentures may become ill-fitting, at which point they may need to be relined. “We can reline dentures within a day. We also offer a while-you-wait denture cleaning service that takes just half an hour,” says Leah. The state-of-the-art Renfert Sympro machine thoroughly removes any plaque, debris or staining that has accumulated. For greater convenience, PDP Denture Studio provides a mobile denture service that will come to you. It gives patients an opportunity to enjoy the same friendly, professional service from the team but in the comfort of their home, retirement home or rest home. Open from Monday-Friday, 8am-4pm, appointments outside of these hours can be made by arrangement. Watch this space as PDP Denture Studio sets sail for its new adventure and in the meantime, call into: 2 Edgewater Drive, Pakuranga – Cnr Ti Rakau and Edgewater Drives. – ‘Experts at Your Service‘ advertising feature.